Friday night we went to David Chang's Momofuku Ssam Bar. While we enjoyed the food, we couldn't wait to leave. The place was loud and not very comfortable. We sat at the bar on "stools" which are nothing more than big wooden boxes and do not give you that "let's have another beer" kind of feeling. Despite the packed space, which seems to have been designed by the Tokyo subway authority, we did enjoy the food. We had Steamed Buns; Four Story Hill Farm Chicken Ballotine (a terrine with porcini mushrooms and walnuts); Satur Farms Fried Brussels Sprouts with chilies, mint and fish sauce (badly pictured here) and Marinated Hanger Steak Ssäm served with ginger callion, kimchi and bibb lettuce. We were also impressed by speed in which the servers describe the dishes (think Federal Express commercials from 1992). My brother baked these for our annual Hanukkah party. He made pear cake with dried fruit; chocolate cherry & pistachio biscotti, and rocky road brownies. This is pure EatWells. 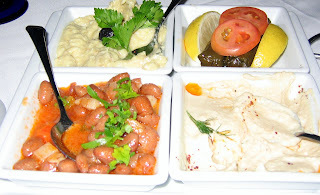 On Sunday we went to Turkish Kitchen on Third Avenue in Manhattan. We sat upstairs in the spacious, dimly lit room that warmed up considerably after we arrived. We started with a cold, mixed appetizer plate. It included stuffed grape leaves, Cacik (chick pea & tahini paste, seasoned with garlic and olive oil), humus and Yalanci Dolma (red kidney beans.) We requested a change but our waiter informed us that the "no substitution" rule was in effect and would not be waived. Despite our doubts, the beans were enjoyed by all. We also shared a Kofte, a patty stuffed with ground lamb and spices. 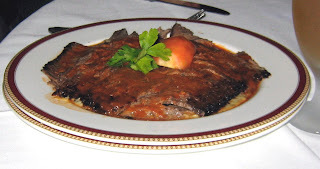 For the main courses, lamb was the star. 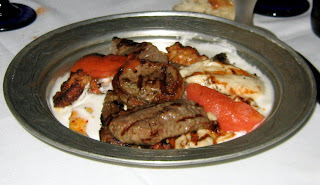 We had it as pirzola (baby chops), donner kebab (vertically grilled over rice); Yogurtlu Karisik (combination of lamb and chicken. 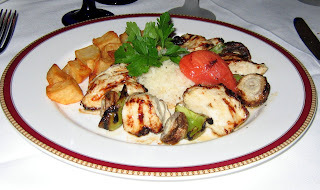 chargrilled, served with garlic yogurt and tomato sauces on pita bread) and another kebab dish served over eggplant. We also had a chicken kebab dish served with potatoes. All this was washed down with a few Efes beer, a Turkish Lager. We finished the meal with two desserts- Baklava (very thin layers of dough with walnuts in between layers) and Kunefe (shredded wheat with pistachio and cheese soaked in syrup and baked in oven).